Keep Mississippi Beautiful partnered with Keep Ridgeland Beautiful to transform Midway Park. Cities today often operate on shoestring budgets, making the community improvement work of volunteer-based organizations like ours highly valuable. We plant trees, clean up litter, encourage recycling and enhance our surroundings – all efforts to improve the quality of life for Mississippians. This year, as part of our Great American Cleanup State Kickoff, we worked with Keep Ridgeland Beautiful to transform a small park into a community resource. Nestled in the historic McLaurin Heights neighborhood, Keep Ridgeland Beautiful board members discovered the park a few years ago and saw it as an opportunity for improvement by adding a picnic area, seating and improved recreation features. 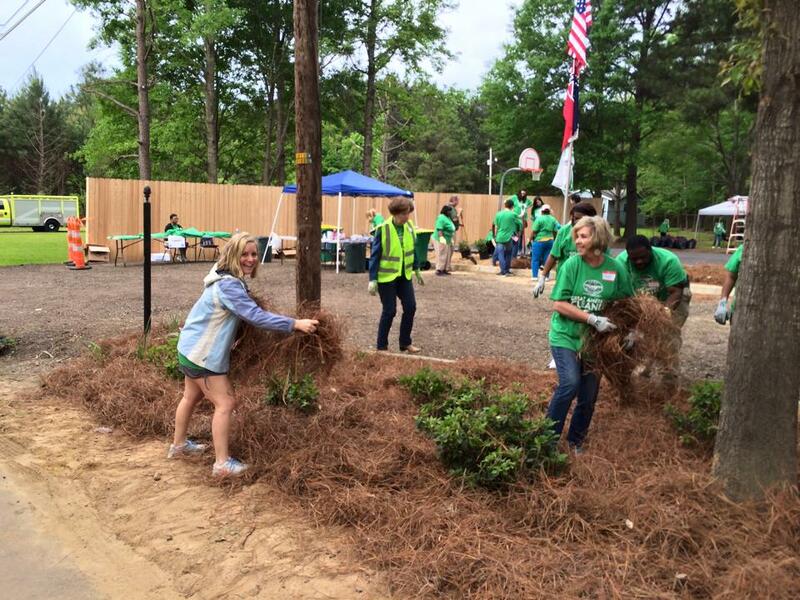 This cleanup helped Ridgeland take this park to the next level. Check out what volunteers accomplished at Midway Park in this before-and-after photo. Photo by Renee Buckner. One neighbor at the event told us, “I plan to keep an eye on this park and make sure its users keep it up.” It’s great to see how engaged the neighbors are. During the cleanup, about 85 volunteers helped install grills, picnic tables, benches, trash, recycling receptacles and even a pergola. Students took the lead on building the pergola as part of a Technology Student Association construction challenge. The basketball court was resurfaced leading up the cleanup, and volunteers striped new lines, cleaned backboards, put up new nets and added another goal. Volunteers also added wood chips to the park’s playground, where city employees installed to spring riders for young children. We can’t forget our many volunteers with green thumbs. We spruced up the park with six new trees, dozens of shrubs and flowers and fresh pine straw to enhance the aesthetics and soil of garden beds. They also picked up litter near the park, including a neighboring wooded area. And finally, the park got an official sign, which will help ensure Ridgeland citizens know about this local place. We’re thankful for the volunteers who gave their time and to our many sponsors who helped us make this work possible. Sponsors included: Keep Mississippi Beautiful, Keep America Beautiful, Keep Ridgeland Beautiful, City of Ridgeland, Bulldog Construction Company, Bufkin Mechanical Inc., Waste Management, Ad Camp Inc., Southwest Distributors, Troy-Bilt, Brown Bottling Group, MMC, Colonial Heights Baptist Church, Audubon Homeowners Association, First Ridgeland Baptist Church, Mississippi Railroad Association and Ridgeland City Garden Club. Also, a special thanks to our city leaders, including Tim Taylor and Mike McCollum. It’s amazing how we can improve and enhance places, like Midway Park, when working together. Projects like this one are happening across Mississippi as part of the Great American Cleanup, a nationwide clean sweep. More than 200 Great American Cleanups will happen in Mississippi from March to May. Let’s keep up the good work in keeping Mississippi beautiful!